Altruism Ireland is a technological charity and our primary purpose is to reduce the high costs associated with fundraising by delivering a free platform for fundraising and donating; building greater trust into charity-giving through introducing transparency metrics into the charity sector; and offering free digital education to Irish charities to help them take advantage of the opportunities offered by new innovative technologies. We are the first free platform that addresses the high cost of fundraising and also the first to link transparency to the act of donating, creating a relationship of trust between the general public and the Third Sector. A recent Fundraising Performance Report by 2into3 found that the average cost of fundraising offline is 30 cent per €1 raised. In terms of online fundraising costs, compared to our competitors that are private enterprises that charge in the region of 5-8% on donations, Altruism Ireland takes 0% commission, ensuring more money ends up with charities and the vital services that they provide. Moreover, we are the only platform in the world that ties fundraising in with transparency, building trust and confidence into the sector so that people know where their hard-earned cash is going. Because we are setting out solutions to two major challenges facing the non-profit sector in Ireland and, by doing so, giving people want they want to see – lower fundraising costs which means that more money goes towards the cause, and greater transparency. Over the last few years people are becoming more discerning, and when they do give to charities, they are fed up with some of the fees companies make off charities. Therefore, we believe that disruptive technology that ensures donations given in the name of charity reaches the intended audience with as little interference as possible in the process will be well received. In terms of transparency, the proportion of people not trusting charities is two times more compared to the people who trust charities (Amárach Research “Donor Insights”, January 2016). Although the vast majority of charities are well-governed, all it takes is a couple of scandals for the reputation of the sector as a whole to come under scrutiny, impacting donor confidence in charities overall. Even through simply talking informally, we came across people who admitted as much. One guy in particular mentioned how when he was younger, every Christmas his dad used to make a donation to a local charity as part of their present. A few years ago, once a couple of the scandals broke, his dad stopped giving to charities at all. By giving people the type of information they need to make informed decisions as to which charity to give to, in a user-friendly format, helps combat this and allows for mindful giving. We are based on Macken St, inside the DoSpace co-working unit in the Trinity Technology and Enterprise Campus. 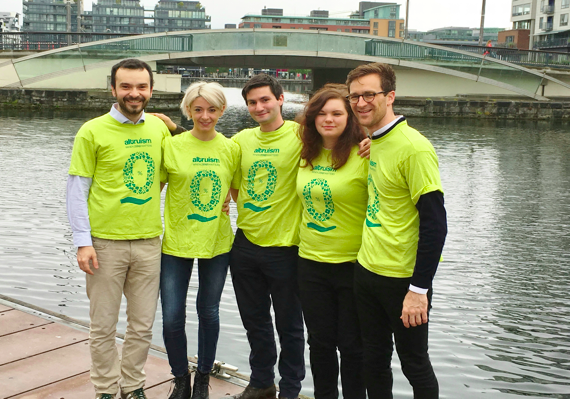 Altruism Ireland launched at the beginning of 2016. The UCD Volunteers Overseas charity came on-board this year and has been hugely successful given the uptake in the amount of fundraising pages that have been set up to address various causes in the developing world. Every year, students devote their time and skills to help dedicated projects in construction and education in countries as diverse as Nicaragua, India, and Tanzania, creating lasting change that positively impacts on the locals who are then able to carry on the work being done. Knowing that significant savings will be raised through Altruism Ireland compared to our private competitors is rewarding, and ties in with our vision to see a transparent system of charity-giving, ensuring more money ends up in the hands of those who need it most. In a nutshell, any person who donates to, or fund raises for, charities. The World Giving Index by the Charities Aid Foundation previously consistently ranked Ireland in the Top 5 most charitable nations, until last year when it dropped drastically by five places to a record low of ninth. Irish people continue to be highly generous though, not just in terms of donating, but also devoting time and resources to good causes. By using technology to facilitate altruism, our ultimate aim is to utilise technology not only to regain Ireland’s status as a highly generous population, but to make it into the most financially efficient and transparent one. Our team consists of a complementary array of backgrounds (Technology, business, and communication sectors), with each member enriching the organisation with valuable skills, perspectives and approaches. On the technical side, we have a full Stack developer with significant experience in the development and design of RESTful web applications, a Motion Graphic Designer and Web Designer. Our advisors are Business Analysts with multiple years of experience in identifying and developing scalable solutions to product-related regional business challenges in order to empower large organisations, and are also strongly passionate about utilising new innovative technologies for social good. We are still only at the beginning of our journey but are ready to scale. In particular, we need to develop our mobile experience and are constantly trying to integrate technology to improve and measure our social impact. Our platform is capable of being replicated and our aim is to create an altruistic revolution in Europe, beginning with creating a better Ireland. At the moment it would be Google Cardboard. I love the potential of VR to create new worlds, and the immersive aspect of it makes it different than other more passive forms of new technology. There is still a way to go before VR reaches its full potential, but at least we’re now on that journey. For us it’s more about leveraging current technology. Going forward, we hope to be able to work closer together with Stripe to have donations processed on our platform without fees altogether. Some things in life shouldn’t be made into a short-term profit-driven model, and, for us, donating and fundraising for charity is one of them. The money that people raise should go directly to the charity and into the hands of those who need it the most. Hence our motto “When Zero Matters”. Altruism Ireland also addresses the lack of digital education in the charity sector. Upskilling is essential in the modern workplace with new innovative technologies providing opportunities to increase efficiency. Therefore, the delivery of free digital education to staff within the charity sector is a vital issue for us, as training will allow charities to improve their efficiency and therefore their effectiveness in delivering their programmes and services to the wider Irish public across the entire country.